IMA-jet is a systemic insecticide used to control a variety of insect pests of ornamental or forest trees. Pests controlled include aphids, whiteflies, soft scales, adelgids, gall forming wasps, leafhoppers, lace bugs, mealybugs, psyllids, serpentine leafminers, sawflies, thrips and leaf feeding beetles. Use IMA-jet as directed in trees in residential, business and commercial areas, golf courses, airports, cemeteries, parks, street trees, playgrounds, athletic fields, commercial forestry production, seed orchard trees, nurseries, and in private, municipal, state, federal, county and local recreational forests. 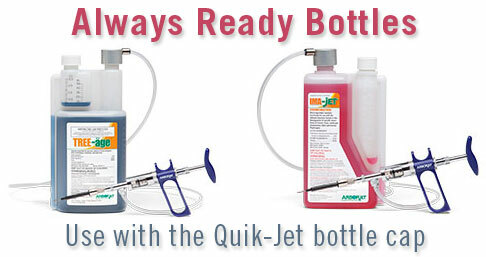 For optimum results, apply IMA-jet prior to infestation. Also apply when insects are infesting and feeding upon the tree. IMA-jet insecticide moves upward into the tree’s canopy from the application sites. • Measure the tree diameter in inches at chest height (54” from ground) to find the Diameter at Breast Height (DBH). If measuring tree circumference, divide circumference by 3 to obtain the DBH in inches. • Calculate the number of injection sites by dividing the DBH in inches by 2. • Multiply the tree DBH by the dosage rate (see table below for appropriate dosage rate) to calculate the total dose in milliliters per tree. • Divide the total dose by the number of injection sites to determine required dosage per injection site. **Not sold for use in Canada, Arkansas, Delaware, Washington DC, Louisiana, Mississippi, North Dakota, New York, Oklahoma and Vermont. AK, DC, LA, MS, ND, VT. US ONLY.